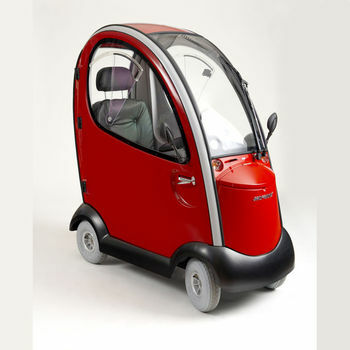 Shoprider is proud to release a world first in function and design with its fully covered mobility scooter "RainRider" The RainRider has been designed and engineered to maximize the users comfort and safety whilst still being practical (Automotive Grade Glass Front & Rear Windscreen, Wipers & Lockable Storage Box). The recently upgraded model now has Fully Carpeted Lining, High Level Brake Light , Interior Sun Blind, Rear Vision Mirror & GPS Data Logger. And when combined with the features already on this impressive scooter , Powerful 2.0hp motor, Robust gearbox, Great ground clearance, Double Pillow Comfort Seat and Delta tiller, you will not be disappointed. 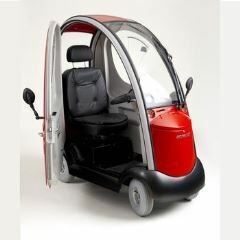 The RainRider has the added advantage of removable doors if the weather becomes too hot (please note optional armrests are required when doors are removed) . This scooter will provide the level of comfort very few other mobility scooters can offer.